Cutting runners and risers from cast components. In a small alloy steel foundry, runners and risers used to be cut from castings using 225 mm (9 in) hand-held disc cutters. Over a typical working cycle, this operation produced an average vibration magnitude of more than 5 m/s2. Operators could have been exposed to this vibration for up to 5 hours a day, giving a potential vibration exposure well above the exposure action value and likely to reach the limit value. The eight workers in the fettling area used 25 000 cutting discs per year. The work also resulted in high noise exposure and a lot of manual handling. As part of a general programme to improve ergonomics and reduce vibration exposure in the fettling area, the company bought an enclosed remote-controlled cut-off machine. The casting is mounted in a simple fixture and cut by a large abrasive disc on a hydraulic arm. 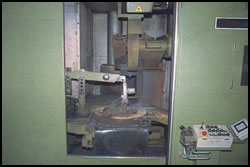 The operator watches the cutting through a window in the enclosure and does not come into contact with any vibrating components. Disc costs have reduced by approximately 80%. The machine paid for itself in 4 years both through improved productivity and greatly reduced disc consumption. The operators are not exposed to any vibration. It has helped in the programme to reduce back injuries at the foundry. The exposure to noise, dust and fumes has reduced. 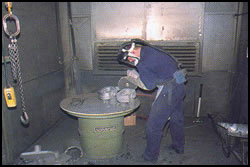 The risk of injury by contact with the cutter or hot metal is reduced. More work can be processed by the same number of workers.